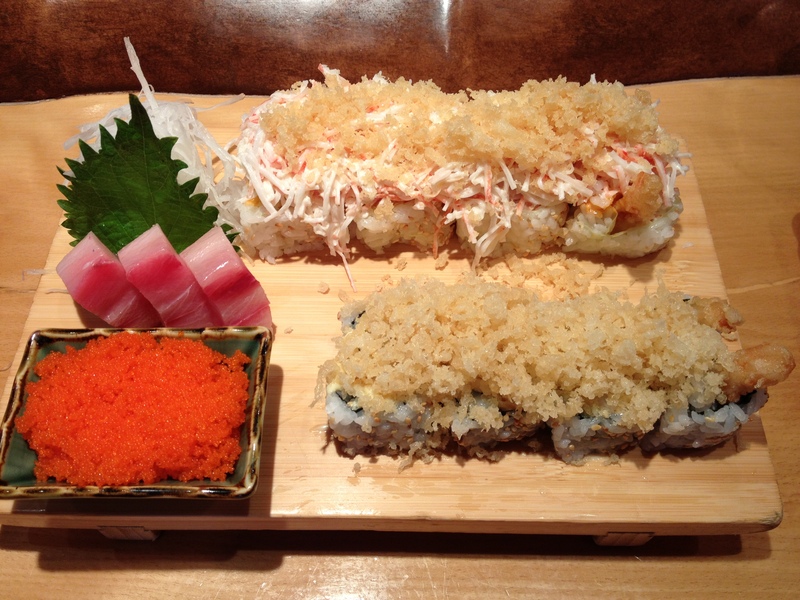 SUSHI IS– WHAT SUSHI IS! I love the weekends when we get a chance to go the our local sushi restaurant to enjoy a few rolls, some Asian BBQ Ribs, maybe a plate of shrimp tempura. I think I just love about everything that they make at Kobe Steak House. Over the 8 years since they opened, we have enjoyed their food almost every weekend. Of course we have favorites, and there are also some new rolls on occasion that strike our fancy. I enjoy introducing friends to sushi that have never gone there before. If they are afraid it is because their idea of “Sushi” is usually that it is raw fish, which it of course isn’t always. So it gives me a chance to explain that the word “sushi” means the way the rice is prepared, not the fact that some of the seafood is eaten raw. The first time I ate sushi was in San Francisco some 30 years ago. At that time there were few if any sushi restaurants in my small town of Independence, Missouri. There is no way one could have found the ingredients needed to make sushi, at least not locally. Now the components are carried in markets everywhere. I am amazed at how popular edamame have gotten in the midwest. Now I see them in all kinds of food preparations. Even as recent as 10 years ago that just didn’t happen around this part of the country. Talk about a paring, love them with dried cranberries…in a salad. How about crab meat, spinach, deviled eggs, maybe a Louis dressing, edamame, dried cranberries, NEED I SAY MORE?..oh my. Being this far from both coasts, I find that most foodie trends hit here about 2 to 3 years after they hit the east or west coast. And newer styles and food preparation methods are for the most part slow to become main stream (but we do have some REALLY fantastic restaurants in KC now, ones that can’t be beaten anywhere in the world, like Michael Smith’s two restaurants, my fav I guess is Extra Virgin, and Blue Stem – which is a James Beard award winner and has done Kansas City proud, Story, Jaspers, our list is growing and I am not naming all of the greats in my list of favorites. But I wander from my sushi. My mind is like a little butterfly when it comes to food. Jumping from one delight to the other. Japanese/Asian/Pacific Rim /Fusion–and it has become a fusion in my poor little brain. There are parts of each regional style food that I totally enjoy eating all at the same time. Thai pot stickers, Yaki Soba – one of my go to comfort foods– miso glaze for salmon, (sake-mirin-plum sauce or brown sugar-miso paste)–also broiled salmon noodle soup. 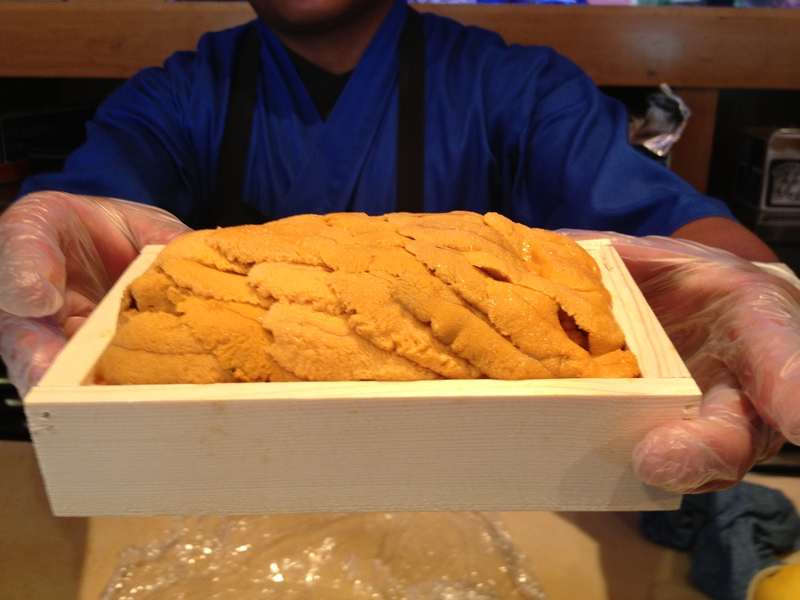 Uni – or sea urchin. Not typically one of my favorites, because it is a textural thing more than a taste thing. 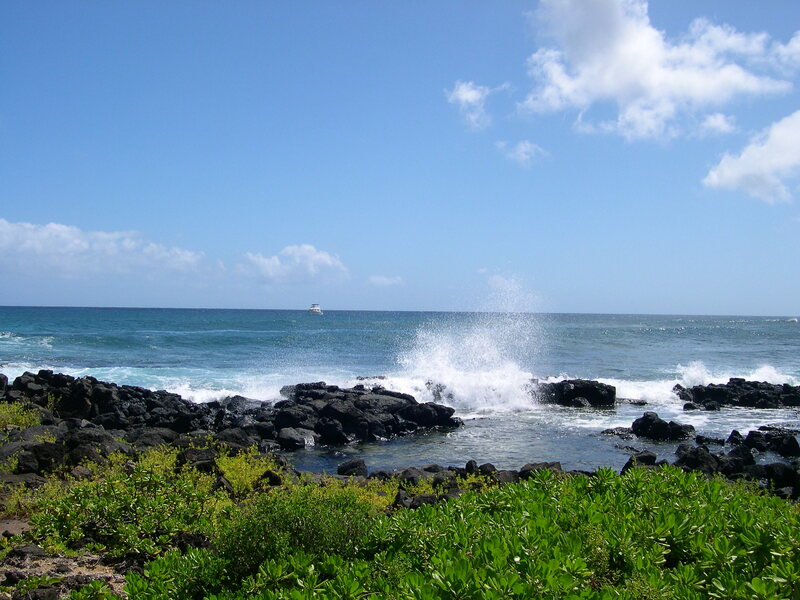 When we were in Kauai, Hawaii we ate at one of my favorite restaurants in the whole world- “Roy’s”. One course was lobster ravioli with an Uni butter sauce. Wow! What a way to use uni. Every time I see uni I think of Hawaii and that wonderful dinner. I am by no means a Sushi purist. I have picked and chosen my favorite gems from all the places I have eaten that serve sushi or a combination of sushi-ish cuisine. It is fun, give it a try. There are lots of rolls that don’t have raw fish. Some don’t have fish at all. 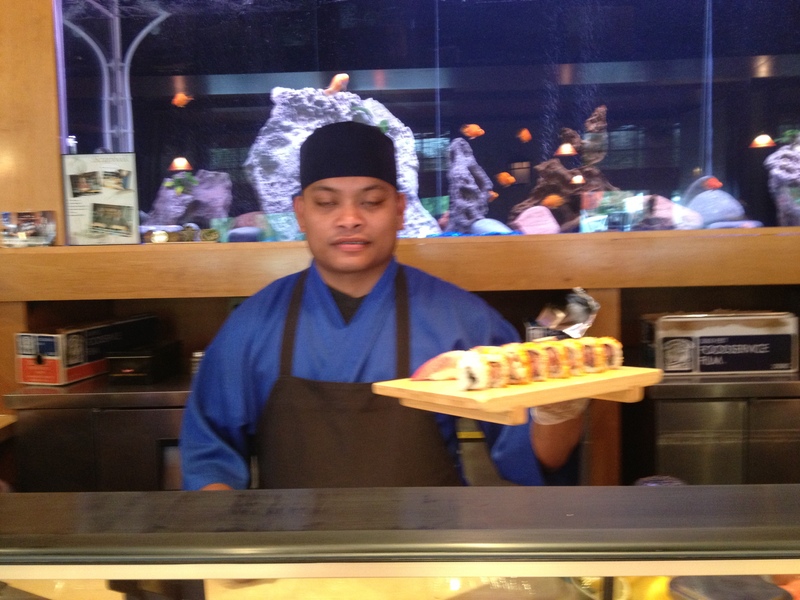 Seat yourself at the sushi bar if you can, so you can watch your sushi Chef prepare the rolls. Posted on May 27, 2013 May 28, 2013 by chefnorma1Posted in Food Blg, food blog, sushi, Japanese Cuisine,, Tuesday MorningTagged Asian, CUISINE, Fish, food, Hawaii, Japanese, Kobe, RICE, SUSHI.